Last time, I looked at a few of the standard products found in a typical supermarket which could be easily used within a folk magical context. I’m continuing that theme today, and while I’ll still be doing my best to stay out of the ubiquitous enchanted spice aisle, I will be touching on a few ingestibles. Please note, however, that as I frequently say: THIS IS NOT A MEDICAL BLOG, AND NO INFORMATION PRESENTED HERE SHOULD BE TAKEN AS MEDICAL OR LEGAL ADVICE. Before you start popping things into your mouth or rubbing them on your skin, you should make sure with your doctor that doing so will not lead to genetic mutation, pestilence, plague, or ennui of any kind. I’m going to start in what my part of the country likes to think of as the “ethnic foods” section, which generally speaking involves a portion of the produce area and an aisle with Asian, Hispanic, and perhaps Italian meal ingredients. It’s where I found the candles I showed in the previous post, but in most of the grocery stores around here, despite the obviously oblivious marginalization that comes with a label like “ethnic” or “international” cuisine, the diversity of the consumer population has made a lot of once-rare items much easier to find. 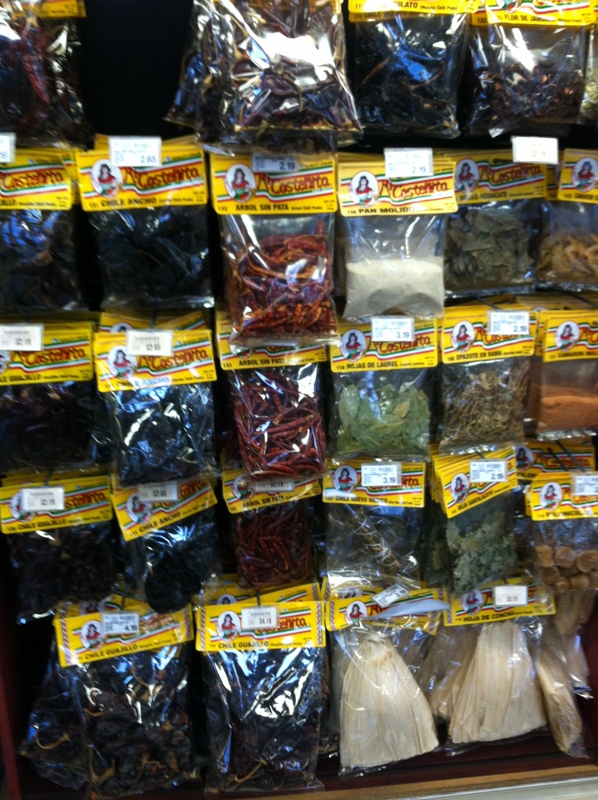 The section of these stores directed at Hispanic consumers provides a number of tools for folk magic that fall under the practices of curanderismo and/or brujeria. I’ve covered supermarket staples like eggs already, so today I thought I’d look at three somewhat more distinctive items: corn husks, hot peppers, and coconuts. 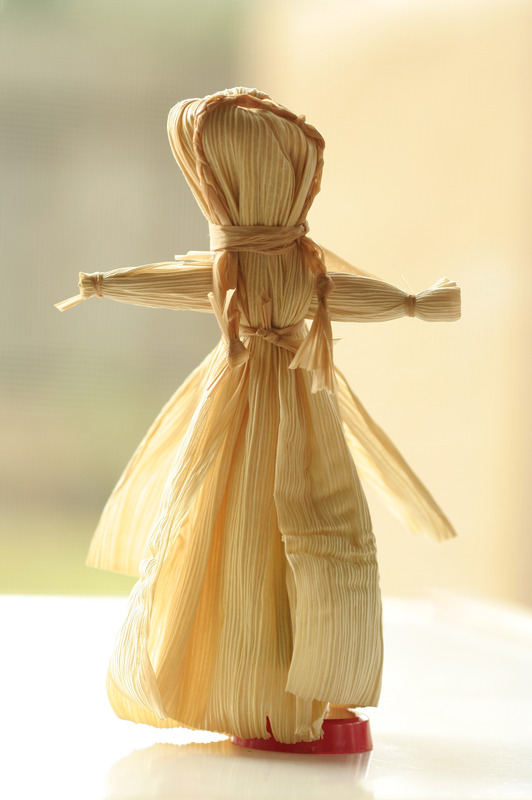 The papery, stiff-but-pliant corn husk is absolutely essential for making really good tamales. Usually these come in huge packs (because if you’re going to go to the trouble of making tamales, you may as well make a lot of them), and they’re often dirt cheap. In fact, in the late summer, I frequently fine freshly stripped corn husks in buckets next to the corn displays, and few grocery store managers care if you grab a sackful to take home with you for free. So what sorts of magical mischief can you get up to with all those husks? “When I was caring my daughter [sic] I was very ill. I was put on bed rest for five months. My Grandma knew this lady and asked her to come to my house and help me during the week. She treated people who were ill. I think that due to her efforts my daughter is alive today. I trusted her because my Grandma trusted her…She prayed over me every day; one day she asked if she could have some of my hair. She could have just taken the hair from my brush, at this time my hair was very long. She told me the hair needed to come from the crown of my head. A few days later she came with this Dollie. This was the first time I had ever seen a doll like this. The body of the doll was a corn cob and the doll was covered in corn husk. When I asked her what it was for all she told me was to keep me and my baby safe. After I had my daughter the Dollie disappeared. When I asked her about the missing doll she told me the doll wasn’t needed anymore. I have never seen another Conjure doll like that one again” (Casas 246-7). Starr’s encounter with this type of doll is not typical of conjure practice, something even she notes, but the use of doll baby magic is fairly common and corn husks make a simple, cheap, easy-to-make-and-destroy sort of doll. One reason that Starr may not have seen them since is that they are less directly associated with hoodoo and more directly associated with mountain crafts, particularly the crafts of the Appalachians. In fact, you can find wonderfully detailed instructions and step-by-step photos on constructing corn dollies in Foxfire 3, which records the folk practices of the southern Appalachians (a later compendium called The Foxfire Book of Appalachian Toys & Games also discusses the corn dolls, but doesn’t give the detail the actual anthology book does). That’s not to say that such dolls are not found in any version of conjure—Dr. E mentions them in his article on doll making, found in The Black Folder, for example—but that they very likely drifted in from non-African sources. Their provenance matters not, though, because they are incredibly useful magical tools in any case. Have you ever seen the sheer plethora of peppers available in a bodega? Even at the chain supermarkets, you can now find dozens of choices, ranging from fresh jalapenos and big, fat Anaheims to the huge sacks of tiny dried japones peppers and the small-but-potent habaneros. So what to do with all those peppers? Of course, the obvious answer would be hot-foot work in hoodoo, but you can also get a little more creative than that. Using the peppers as a vessel, it takes very little effort (but a good bit of practice and caution) to slit open a habanero, stuff someone’s name inside and bind it back up. Doing that works sort of like a vinegar jar cranked up to eleven, in that it puts a lot of unpleasantness into someone’s life. Peppers don’t have to be all bad, either, as cooking them with something like chocolate creates a very different effect—a good hot cocoa with a hint of chili pepper makes an enlivening winter beverage, and a heck of an aphrodisiac! A little rum in that latter option helps, too, of course. “As Lord of Eroticism, he [Ghede] embarrasses men with his lascivious sensual gestures; but as God of the Grave he terrifies them with the evidence of the absolutely insensate: he will not blink even when the most fiery liquid is sprayed into his eyes, and only Ghede can swallow his own drink—a crude rum steeped in twenty-one of the hottest spices known. Thus he may alternately remind men that he is their past, their present and their future, that he is master of their compulsive drive to life and the inevitability of their death” (Deren 104). Deren also notes that anyone claiming possession by Ghede is subject to both of the tests she mentions: having the hot rum sprayed in their eyes and being told to drink it. A truly possessed devotee will have no problem doing so (and likely be able to down the entire bottle of rum and show no effects after the possession ends). If you ever need to pretend to ride a horse, you will probably automatically feel the need to buy a coconut and bang the two empty halves together to simulate the sound. At least if you grew up watching a lot of Monty Python that’s probably what you’d do. The coconut is good for more than equine simulations, however, and you can use the whole fruit/nut and its liquid for several magical functions. Drilling holes in the coconut will allow you to do two things: firstly you can get at the precious liquid, coconut milk, inside. It’s delicious and a wonderfully refreshing drink, but if you can resist the urge to down it all in one go, save some for later. Now that you have a semi-empty coconut with holes in it, why not stuff it full of name papers, sweet things like raw turbinado sugar (also available in the Hispanic section usually) and create a natural honey-jar spell? This sort of spell will, of course, not last as long as an actual honey-jar, but it has the advantage of being very quick and due to the sympathetic magic connected to the coconut’s skull-like density and shape, it works right on the minds of the folks targeted with the spell. “The process of feeding the head is simplicity itself. The coconut milk or cream is scrubbed into the head, just like the head-washing compound or a shampoo. Once the compound has been worked into the head, the hair may be combed out again. However, unlike a head-washing compound, the coconut compound should be left to dry on the head—preferably, overnight. A scarf or towel may be wrapped around the person’s head to insure this…In the morning, the coconut compound may be rinsed out and the person’s hair washed with a shampoo and dried, as it would normally be” (Mickaharic, Spiritual Cleansing, 101). The richness of the coconut milk causes the spirits which guard a person (frequently though to be connected to a person’s head in African tradition) to be refreshed and take a renewed interest in the person’s well-being. It’s sort of like bribing a guardian angel with a good pina colada, which would be another fun way to use that coconut milk if you’re so inclined. Of course, you don’t even have to open the coconut up to use it magically. I’ve seen a house cleansing method which involves simply kicking a coconut around a new home, through every room from top to bottom and back to front. You might say a psalm as you go, or repeat the Lord’s Prayer or the Apostles’ Creed. Other traditions use other incantations, songs, or words, but the point is the same: get the coconut all over the house, kicking it as you go, letting it soak up bad vibes like a sponge. When you finish you can either pick it up in your left hand and take it to a far away tree, where you crack it open and leave it at the roots, or you can drop it into running water heading away from your home. It essentially functions as an egg cleansing for a domicile, but coconuts tend to be less messy than eggs when kicked (Mickaharic has a variant on this practice using a head of lettuce in his Spiritual Worker’s Spellbook). There’s an entire pharmacopeia in a well-stocked bodega, with everything from aloe vera gel (and the live plants) to nopales (prickly pear cactus, sometimes used in curanderismo for treating diabetes) to chicken feet and cattle tongues (both edible, but also both used in various hoodoo spells as well) available to an informed shopper. I mention these three ingredients solely as a way to begin to see the shelves as stocked with more than marketing gimmicks and high-fructose-corn-syrup-laden beverages. While having a good local witch shop is invaluable for many reasons, the grocery store may be your best friend when it comes to simple, practical magic. I know this article barely scratches the surface of the subject, and I highly encourage you to look at some other sources on making the most of a grocery store’s shelves for your spell work. As I said before, much of my own inspiration came from Sarah Lawless’ post on the topic and Cat Yronwode’s compilation The Black Folder, which features not only an article on grocery store magic (covering things like onions and lemons) by Cat herself, but other useful tidbits such as Norwegian bread charms (from Dr. Johannes Gardback) and an article on “kitchen witchery” by Sister Robin Petersen. Of course there are probably dozens of books on this subject, many of which I’ve sadly neglected here. Do you know of any good grocery-store spells? If so, please feel free to post them to the comments below! I may eventually come back to this topic another time, but for now I hope this has been a useful glimpse beneath the barcodes into the magic of the market. This episode features a special one-hour interview with the cast of Conjure Crossroads, discussing the state of conjure in the US. We’ll hear about art, magic, New Orleans, and what conjure looks like today among current practitioners. You can find out more about the New Orleans Folk Magic Festival here, and more about ConjureCon here. Keep an eye out for more info on the New Orleans Magical Meetup on Novemer 8-10, 2013! You can follow the official Facebook page, or watch the website for more details! Today I thought I’d devote a post to, well, other posts. I’m frequently reading, communicating with, or learning from other folk magicians, scholars, storytellers, and various members of the folkloric community. While much of what you find here on New World Witchery focuses on research into history, I don’t want to ever lose sight of the vibrancy and currency of many expressions of folk spirituality and magical living which surround us today. We live in an enchanted world, or at least I like to think so, and I want to share the things that are enchanting me from time to time. So I’m going to try to start periodically posting brief annotated link rolls (the “cartulary” in this post’s title) which might be of interest to readers of this site. Some will be as simple as podcast recommendations or interesting fiction I’ve come across, and others will be more academic in nature, focused on recent research or discoveries in folklore, fairy tales, or magic in general. And some may simply have a nice, witchy feel to them. So let’s get started! I only recently found out that Denise Alvarado and her publishing group put out a neat little almanac last spring called The Hoodoo Almanac, which includes bits of folk magic, lunar astrology, and other almanac-y things. I don’t know if they’ll do one for 2013 or not, but here’s hoping! Alvarado and several other root workers have also started a program for learning folk magic which involves taking several online courses and apprenticing with a live root worker in your area, called Crossroads University. This seems like a great way to learn this particular branch of folk magic. Similar courses can be taken through Lucky Mojo and Starr Casas (a very knowledgeable rootworker and friend to us here at NWW). Speaking of books and learning, I recently read a review in the Journal of American Folklore (JAF) for a 2006 book on the infamous Pied Piper of Hamelin. The Pied Piper: A Handbook, by Wolfgang Mieder, looks like exactly the kind of in-depth, thorough investigation of the story behind the fairy tale that I love. This is the sort of book I can sink into and lose a few months of my life, so it’s already on my holiday wish list, and the JAF review gave it glowing praise as well. Arrowclaire, over at her lovely blog Wandering Arrow, always puts up interesting posts. She had one on dealing with death omens recently that I greatly appreciated, because it puts into perspective the idea of living an omen-driven life without necessarily becoming fearful or overly superstitious. Rue of Rue & Hyssop had a beautiful post welcoming the autumnal season in. Check out the rather gorgeous PDF (but high-gloss) Pagan Living Magazine in her sidebar, too! Speaking of great and stunning periodicals, the absolutely amazing Hex Magazine: Old Ways for a New Day is very worthy of your time. It focuses very heavily on Northern European and Teutonic folkways, but also includes a good bit of New World lore, too. To get you in the mood for a spooky October, go take a peek at the great post Peter from New England Folklore has done on “Kidnapped Witches in Plymouth.” (Storytelling is an October tradition at NWW, so this should get you ready for next month nicely). That’s my cartulary for today! Happy reading, everyone!